Tree and Violet-Green Swallows are very disciplined birds. Every year they arrive in the Mat-Su Valley about May 8, quickly find an available nest box, gather twigs and grass to build a nest, layer the nest with feathers, and after 4-5 eggs are laid, nestle in for the next two weeks. Daily you’ll see swallows flying overhead snatching insects out of the air, hearing chirps and gurgling sounds while they feed, while one parent remains on the nest incubating the eggs. Then the babies hatch, and for about 20 days both parents are very busy finding bugs for hungry nestlings. Soon a baby swallow head peeks out of the box and the cheeps of little voices tells us others are inside awaiting lunch, too. Mom and dad alternate poking their heads into the box with mouths full of food to feed the babies. If you get too close to a nest box with swallows about to fledge, protective parents will fly straight at you, zipping over the top of your head, giving a warning buzz, “Stay away!”. All too soon, it seems, the little swallows are ready to leave the box and join their parents, learning to pluck insects out of the air. Incredibly, the swallows fledge fully feathered and flying. But not all. Occasionally, one or two flutter to the ground or a nearby tree, awaiting food and encouragement from their parents. After a day or two, some flapping of wings, and diminishing attention from parent swallows, the fledgling realizes it’s time to fly and learn to feed itself, and it’ll join its family in the air. Joining other swallow families, they all leave about July 4. 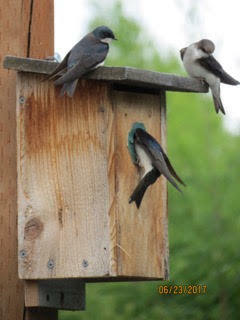 At Alaska WildBird we’ll intake swallows whose nest box has been blown down or otherwise disturbed with no parents around, or a single swallow left behind when the others head south. The challenge is to feed appropriate food until the swallows are healthy enough to fly, then find another swallow family to adopt the fledglings and teach them how to feed in the air. Swallow parents willingly foster fledglings, left near their nest, and include them in their migration with other swallows. Key is finding another active nest with its swallow parents readying their young to fledge and migrate. If you find a baby swallow that appears to have fallen out of the nest, first watch for parents flying over or near, indicating that the fledgling is being watched and just not ready to fly. Keep any pets away from the area and call Alaska WildBird (892-2927) for instructions on whether to capture the bird and bring it to the Center, to move it to a safe place, or to continue to watch the parent swallows encourage the fledgling to fly. Usually within a day or two the fledglings have joined their parents and are on their way south!